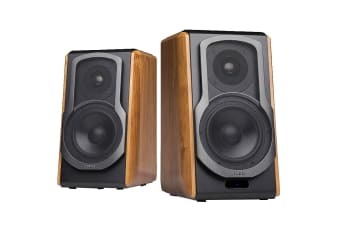 The Edifier S1000DB 2.0 Lifestyle Bookshelf Bluetooth Studio Speakers feature Bluetooth aptX. Widely used for public broadcasting, musical performances and filming in studios, Bluetooth aptX can stream sound wirelessly, delivering CD-like quality. With the Edifier S1000DB 2.0 Lifestyle Bookshelf Bluetooth Studio Speakers, you can stream high quality sound wirelessly with minimal loss; a true professional standard. The front facing drivers of the S1000DB 2.0 Bluetooth bookshelf speakers are positioned for optimum performance. It delivers a hefty 120 Watts in a stylish yet simplistic form with 5.5” aluminium bass drivers. These drivers create a surge of bass for anyone looking to get the most from their sound. The angled design is made specifically for creating a larger sound with a low frequency. This design is incredibly robust, which makes it reduce the resonance of the sound. Attaching the grill of the S1000DB reduces the attenuation, so you can get the full strength of the sound signal. Connect the S1000DB to any style of input. Equipped with optical, coaxial, PC and auxiliary inputs, the S1000DB is Edifier’s latest admission into 2.0 Studio Series. In addition, tune volume, bass and treble to the exact settings you enjoy. Easily identify which output your speakers are set to with the LED status indicator on the front of the speaker. Each input has its colour indicator, so you can tell which input is selected without a fuss. The S1000DB comes with a wireless remote control used for taking control of your sound. Switch between inputs easily from the comfort of your seat. The buttons are easy to understand and form fitting enough to grip in any area of activity.